Spanish Removals - What Should You Pay For Removals To Spain? Spanish removals could be necessary for work, or perhaps for retirement plans. Maybe you are simply keen to start a new life abroad in the sunshine. Whatever your reasons for moving to Spain, choosing the right removals company is the first step to a stress-free removal day. How much should you pay? Although you don�t want to be paying too much for Spain removals, the lowest price doesn�t necessarily mean the best service. The idea of hiring your own van and doing the entire move yourself may sound tempting, as it will initially cost less; but the extra money soon adds up. You could end up paying much more than you had first thought you would. 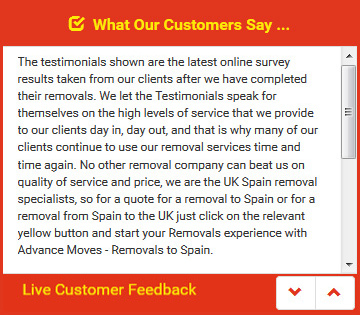 Removals to Spain is a specialist and skilled job, and therefore it is worth looking around and getting more than one quote before committing to a removals firm. Not only is price important, but if you speak to more than one company, you can ask them specific questions about your move and your belongings. Their answers could help you choose between them. Although the costs will vary between companies, it is important that each quote you receive details exactly what you will get for the money you will be paying. This is a useful way to compare the different companies you have been speaking to, as it can be otherwise difficult to assess the quality of service you will receive. In reality, the more items you have to move, typically the more it will cost. Added to this should be the distance of the move itself, and the time it will take to complete it. Advance Moves are experts in Spanish removals and can help you from initial query to finalising your move. We pride ourselves on our excellent customer service and exceptional prices. See our website at http://www.advancemoves.com/ or contact us on 0871 218 0612 or info@advancemoves.com to find out more.